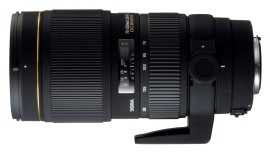 Sigma 70-200mm f2.8 EX DG APO Macro HSM II review: what great progress! The Sigma 70-200mm f2.8 EX DG APO Macro HSM II is not very expensive, but… When first released in December 2007, this lens was presented as a compromise in terms of price, especially when pitted against such competitors as the Canon 70-200 mm f2.8 L USM (1995) and the Nikon AF-S VR Zoom-Nikkor 70-200mm f/2.8G IF-ED (2002). The Sigma’s large aperture (f/2.8) and its macro mode (minimum focus distance one meter) lend this tele-zoom lens great versatility. It is solidly designed, offering fast autofocus as well as Full-Time manual focus to allow greater precision in macro mode. Note, however, that Sigma’s 2010 stabilized version of the same lens lacks the macro mode. Despite its elevated price (twice as much as the Sigma), we prefer the Canon (which appeared in 2010). Why? Because even though the overall DxOMark scores for both lenses are very close, the Canon’s resolution is much more homogenous across entire focal range and over the entire field. We draw the same conclusions in this comparison as for the Canon v. Sigma above: the Nikon is a far superior lens (and its price reflects this). But still, Sigma makes real progress! Even though the competition still beats the Sigma 70-200mm across the board (as noted above), when we compare the newer version versus the older version of the same Sigma lens, we see big improvements in resolution and chromatic aberration in the 2010 stabilized version: the resolution improves by more than 10 points (going from 42 lp/mm to 54 lp/mm), and chromatic aberrations drop from a very high 21µm to a very respectable 8µm. In conclusion, although the 2007 Sigma 70-200mm F2.8 EX DG APO Macro HSM II lens can allow you to capture a greater range of distances than the stabilized version, if you’re trying to decide which Sigma model to choose, we recommend the 2010 version because it delivers much better image quality.